These services are primarily targeted at small to mid sized organizations and large sized companies who want to have an Independent and professional support in the Regulatory compliances on a support model basis. Service tax compliances including registration under the Service Tax, managing monthly/quarterly service tax deposits and filing of quarterly/half yearly returns, assistance during Service Tax Audit & Liaisoning with the Department. 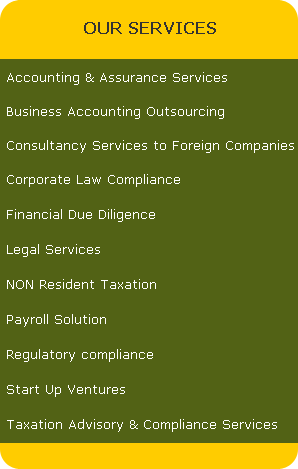 Regulatory compliances audits covering payroll, labor matters, direct taxes etc. (This is designed as per the regulations applicable to each client).